Istanbul, Turkey. There’s so much to say about this enormous, cultural city that I don’t know where to begin. It has always been an important and mighty city throughout history, and continues to have a powerful effect today. We caught a boat across the Bosphorus to get from the Asian side to the European side of Istanbul. This sprawling city is partly in Asia and partly in Europe—the only city in the world on two continents. As we approached land, we saw mosque minarets rise above the rest of the buildings like needles all along the horizon. 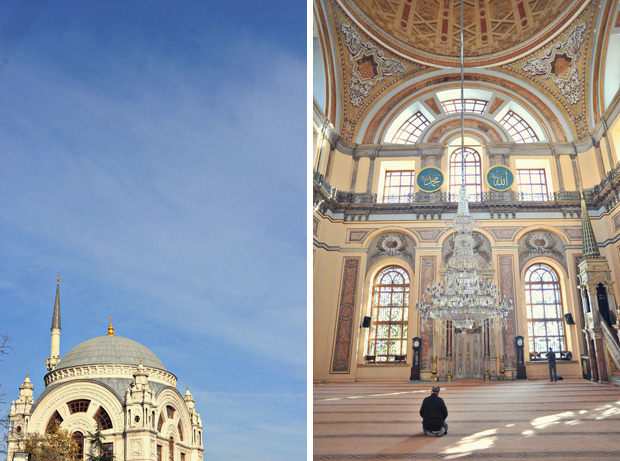 We had seen our fair share of mosques around Turkey already, but nothing like this. We knew from the first sight that we’d have a lot to photograph here. The place is such a unique blend of old and new. It was the first big city we’d been to in awhile (after making our way through small, simple towns and islands in Turkey, Greece, and Croatia). We were impressed with how modern it was. We hadn’t seen tall buildings, busy downtown streets, posh hotels, or fashion on the streets in a while. It felt so good to be back in the hustle and bustle of one of the biggest cities in Europe (population of 12.8 million!). Yet although the city has grown and modernized with the rest of the world, the streets still contain so much old-world charm, ethnicity, and mystery. First of all, you can’t miss the ancient and intricate mosques on every other corner. Even among the sleek metro and the business people, the Muslim call to prayer sounds 5 times a day. You can hear the muezzins’ melodious voices coming from every direction and overlapping each other because you’re constantly surrounded by so many mosques. 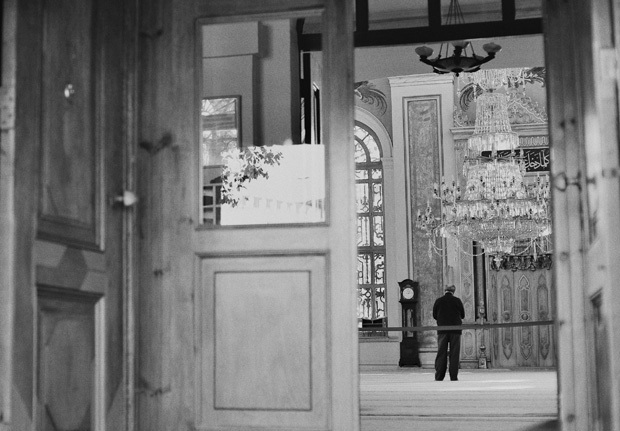 In front of every mosque, you can see Turkish men washing their feet, hands, and faces at an ablution fountain before entering the mosque for worship. A surprising amount of women in the modern city wear traditional Muslim head coverings and very modest clothing—ankle length skirts and trench coats. I sometimes felt overly exposed. I can’t imagine what summer must be like in Istanbul, since that’s when we show the most skin. Tea is just as prevalent as in the smaller Turkish towns. 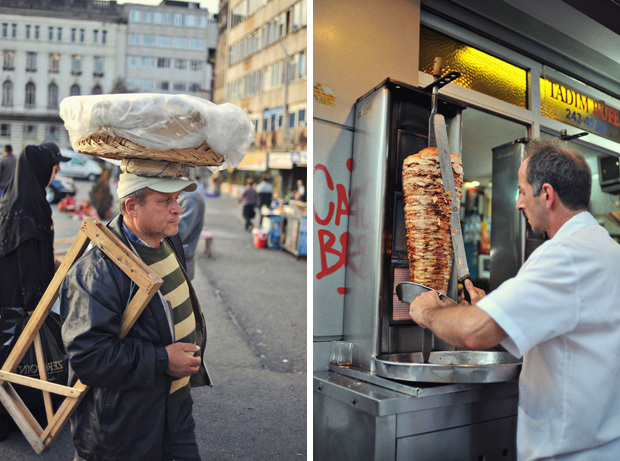 The majority of restaurants serve traditional Turkish food like kebab and pide. 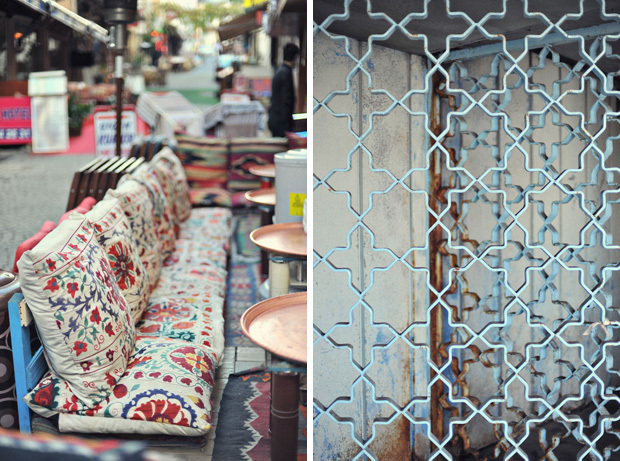 I was drawn to colorful glass lanterns, low tables with cushions for chairs on the floor, and of course, more rugs. I have never seen so many patterns in my life, whether its on rugs, pillows, walls, tiles. I wish I photographed the patterns more for future design inspirations. A small embroidered pillow is a work of art all by itself. In Istanbul we took the metro every day and STILL did a ton of walking. Not only does the city cover a lot of ground, but it is built on seven hills. Every day we crossed a bridge over the Golden Horn inlet past a ridiculous amount of fishermen. I was delighted to sit for hours at classy cafes people watching. I missed cafes. Every day we started our day with a nutritious Turkish breakfast at our hotel—a boiled egg, tomatoes, cucumbers, olives, cheese, and bread with jam. 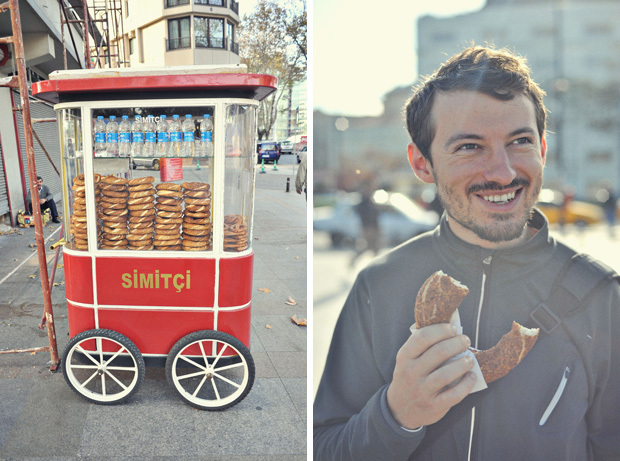 And every day we bought a sesame seed covered simitci roll from a street vendor during our hours of walking. 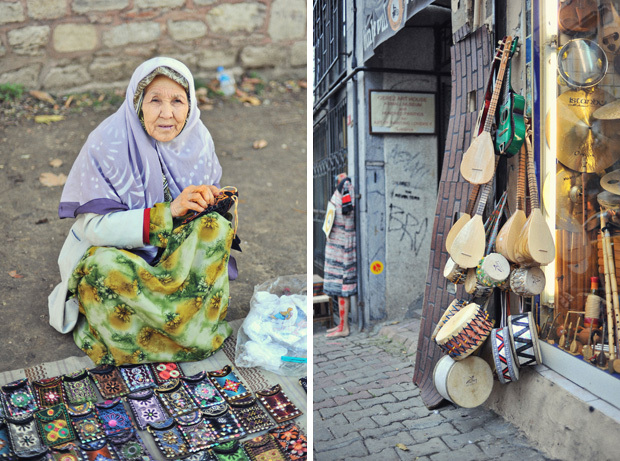 Istanbul has so much culture and color, something that you’d expect would fade away in such a big metropolitan city. I felt like I could stay forever. 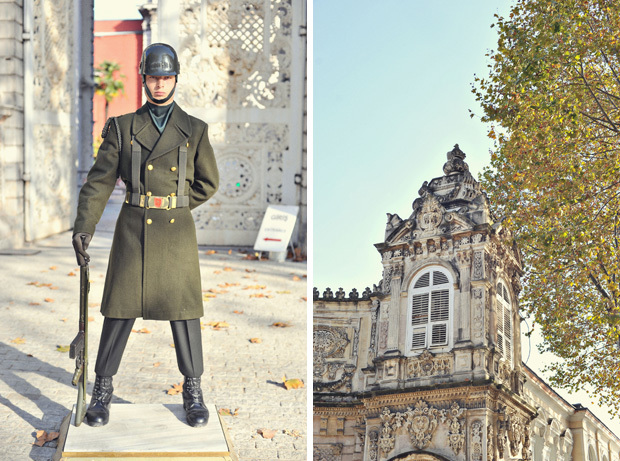 Coming up: many more general posts around the city, a post dedicated to Turkish food, a photograph collection of Muslim women, a small street fashion post, and a highlight of a vintage boutique we were lucky to stumble upon. Happy to travel with you. That armed guard is pretty smokin' hot. Love the way you capture the city. If I have a favourite city, Istanbul would be very high on the list! 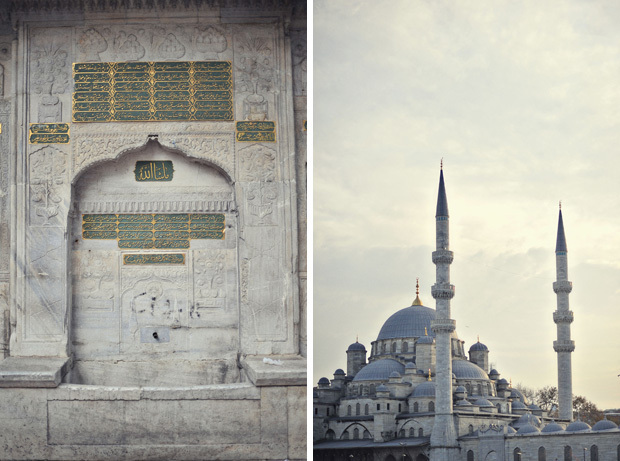 Istanbul is such a mix of everything old and new, East and West and a everything in between! It never even occured to me that a city could be on two continents. Wow. Muslim, like the word "Christian," is always capitalized. Those lanterns are stunning. I had no idea that this city was on two continents that very fascinating. Looking forward to the fashion post and your highlight of the vintage boutique you two stumbled upon. Hello and Happy New Year! I'm new to your blog, but I feel so lucky to have stumbled upon it. 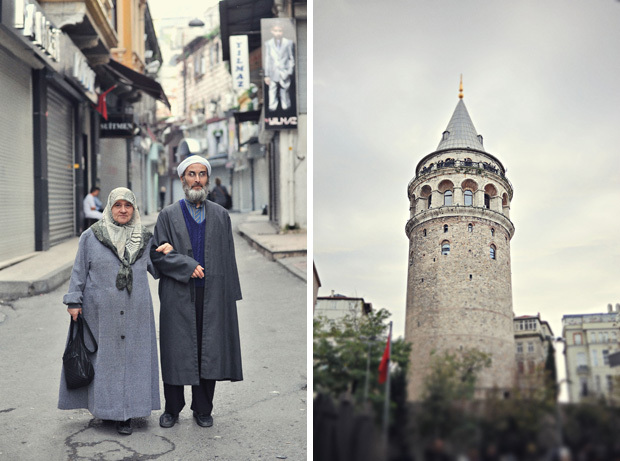 This is such a great post- my husband and I are planning to visit Istanbul by year end and what you have here is really helping. Great, great pictures too! I just found your beautiful blog and spent the last 2 hours at work looking through your amazing pictures! You both are so blessed to be able to do this! My husband and I are trying to get to Europe before we start having kids (possibly next summer) but its fun to live through your pictures and adventures until our turn comes! istanbul looks like such an amazing city! such a mix of old and modern and the architecture is incredible! I would have such a hard time not wanting to buy so many of the beautiful things you see! Just found your beautiful site. I enjoy browsing through your images. Looks like an incredible experience. Thanks for sharing. Rebecca, Sya, Camellia- Welcome to the blog and thanks for saying hello as a new reader. Glad to have you along for our travels until your next trip. Nateniale- I agree with you about Istanbul. Just checked out your blog- very cool stuff. Will be following your travels as well. Newton- Thank you for the correction. I should have known that. Daniel- We're working on catching up! Blogging and traveling isn't as easy as we thought. Especially when it involves editting massive amounts of photos for each post. Istanbul and turkey are muslim country and Muslim business setup will be awesome, I think so. It will strengthen muslim community and will protect muslim legacy.